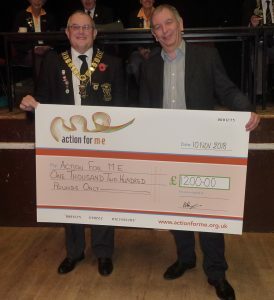 On November 10th at St Stephen in Brannel Community Centre, Bowls Cornwall held their AGM, at which the President Peter Prynne made a cheque presentation to Action for M.E, which was his chosen charity for the year 2018. A trustee from the charity, Chris Cundy attended to accept the cheque which was for £1200.00. Chris Cundy explained that the money would go towards funding the ME Helpline for two weeks, which to those with the condition was a lifeline. The money raised was by having ‘Spider’ Collections at the beginning of selected matches in Cornwall, Devon and Somerset, donations and also a Bowls Drive held at the President’s Club ‘Dunheved’ organised by Mrs Christine Hore, Bowls Cornwall Administrator. Myalgic Encephalomyelitis is a chronic fluctuating neurological condition, affecting all ages. It is estimated M.E. affects one in 250 people in the UK, including around 2,000 people in Cornwall, one in a hundred young people aged between 11 -16 years have M.E. and is the most common cause of long term absence among school children. One in four people with M.E. are so severely ill they become house and/or bed-bound. It is more common in women than men. Also the Middleton Cup team won the four games in their group to reach the Quarter Finals losing to Devon. The White Rose Team played in the Regional Finals also losing to Devon. Peter and members of the Presidential team gave good support to all our competitors both at Leamington and at venues both within the County and beyond. We look forward in anticipation to an equally successful season next year.